Last week, Michael Hartman won the Tea Party gathering straw poll with 60% of the vote. If it had been a fight, they would have stopped it. No one else was really close. Advantage - Hartman. And, so far, Jim Barfield is winning the money race. He has raised over $45,000 – with $25,000 coming from his own bank account as a loan. That’s still a net of $20,000. Pretty impressive at this stage. At first glance, Hartman looks impressive too with about $38,000 raised. However, almost $35,000 of that is personal loans. Advantage – Barfield. And it is easy to further identify Barfield as the “establishment” guy by looking at who has donated to his campaign. Many are from the Chamber of Commerce/United Way/EDC crowd – names like Baugher, Hermansen, Bjerning, Hobbs, Byron, Proctor, Hoyman, Swann, Podnos, McLouth, Bakke, Kabboard, Bancroft, Rood, and Weldon. If you look at the society pages in local publications, you know who these people are. Not that there’s anything wrong with these people. Many are community benefactors and have done much great work in Brevard. But they are who they are. On spending cuts, Barfield would delay projects that haven’t started and wait to fill vacant jobs openings. Hartman said he would cut administrative costs in EELS and HHS. Regarding the Economic Development Commission, Barfield is status quo and Hartman says that the county should not fund more than 50% of its total income. 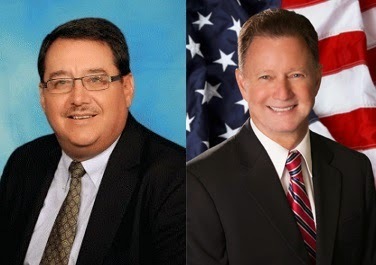 I have heard that overtures have been made to Ron Taylor – the other self-professed conservative in the race who garnered a distant second to Hartman at the straw poll – to drop from the race so the conservative vote would not be split. However, I saw brand new Taylor road signs out just yesterday on south Merritt Island. That doesn’t sound like a guy who is considering backing down. So…Hartman has the grassroots and Barfield has the cash. The next few months will prove interesting in how they campaign to best capitalize on their strengths and mitigate their weaknesses. What we should be voting on is deleting that entire office from the chain of government offices and streamlining the fat, redundant local and state governments. Barfield actually said the EDC was doing a fine job so he is more of the same. NO THANKS!!!!!!! He won't be getting my vote. I remember Chuck Nelson campaigning on the Republican ticket. He just wailed about how he would cut taxes and reduce government. He's done just the opposite. He supports nearly every tax increase that comes up and he's increased regulations 10 fold since taking office. We don't need more people like him in office. The power over the people our local government has is downright scary. It needs to be reduced. Just ask anyone that has to obtain a permit for anything. Scary!!!!! What have you been smokin' Charles? To my knowledge they haven't legalized medical marijuana yet. I have qualified by petition and "No One" has made "overtures" to me about withdrawing from this race. Either reveal who said this or print a retraction. This is a serious breach of ethics on your part. You should have had the decency to call me to verify this information. You've been played by someone. BTW Michael Hartman only got 96 votes at the Tea Party event which was poorly attended compared to past years. Hardly a statistically significant number when considering there are 31,956 Republican voters in District 2 and over 800 voters signed my petitions. This race is going to be a fun one all the way to the end. Fasten your seat belt and try to be a little more objective and accurate in your reporting. He's got my vote. The "others" seem to be more of the same old "good old boys" of the system. Especially Barfield.....wouldn't vote for Barfield if he was the only name on the ballot. I wouldn't vote for either one. If they're Republican, they can't be trusted. Look at the donation list, all of Brevard's big buck "good ole boys"...That the problem with this county. Rich Republicans! Thank God for we rich and employed Republicans. Who else would support the lazy deadbeats on welfare and Obamacare. Wow, if we rich Republicans are so bad, maybe the jobless Democrats should stop taking the money we earn by working everyday rather than laying around sponging off society. If I you want the money the rich have then why don't you go to medical school, law school or be smart enough to run a fortune 500 company? I second that. We needs some real Democrats working for the PEOPLE, not just the rich republicans who keep getting elected, year after year....WAKE UP BREVARD! By "working for the people" do you mean figuring out how hard working and educated Republicans who earn a salary commiserate with their level of education can support the lazy leaches of our society? Really? Obama and his fellow Democrats have done so much for our country...NOT! Republicans are considered rich because they value education and hard work earning what they have, rather than the sense of entitlement that the Democrats espouse. Just because I have it does not mean you're entitled to it. We certainly do NOT need more of the change Obama and his ilk proposed. That clearly did not work out!